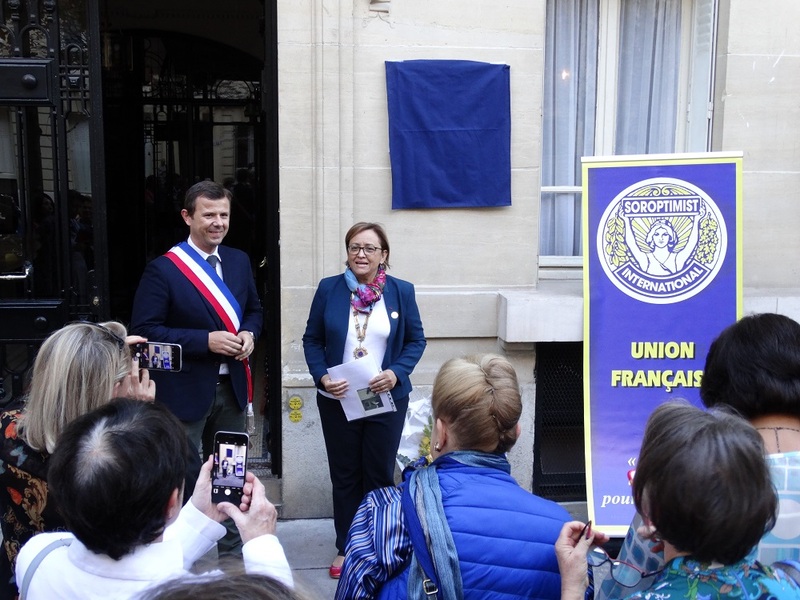 On September 27, 2018, the French Union of Soroptimist International paid tribute to Dr. Suzanne Noël (1878-1954), by inaugurating a commemorative plaque on the facade of the building located at 36 Avenue Charles Floquet in the 7th arrondissement of Paris, where Suzanne Noël lived during the last 15 years of her life. Suzanne Noël was the pioneer of the Soroptimist Movement in France and in many European capitals and founder of the European Federation Soroptimist International of Europe (SIE). Photo: Evelyne Para, President of Soroptimist International Union of France 2016-2018 and Christophe Poisson, Deputy Mayor of the 7th arrondissement of Paris just before unveiling the plaque. 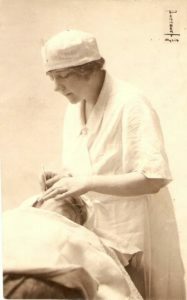 Photo: Suzanne Noël performing reconstructive surgery. At a time when women mostly resided in kitchens and salons and just one or two women per year were accepted as medical interns in the Paris hospitals, Suzanne Noël was accepted as medical intern in 1913, and was the 4th best candidate of the 67 nominees. From the beginning of World War I, she became one of the first women surgeons in France, pioneer of reconstructive surgery, giving an identity, a human face, to soldiers whose faces were shredded by shrapnel, who nobody recognized, or could even look at. Subsequently, she was also a pioneer in plastic and aesthetic surgery, always stressing the social importance of such treatment. She extended her surgical activities, until then confined to the face, to other parts of the body, and invented techniques still used today of removing fat which we call now liposuction. Her merits as a doctor were recognized in 1928, when she received the Legion of Honor “for her contribution to the scientific reputation of France on the international scene”. Suzanne Noël also achieved much in another field, daring to found, in 1924, a women’s club: the 1st Soroptimist club in Paris. It was inaugurated with 56 founding members, the women taking no notice of the insults directed at them for claiming the right to vote. One can imagine the determination, the character, and the courage that was necessary for Suzanne Noël to brave the prejudices well established in the high society into which she was born. There were many difficulties. The concept of a club for women was unknown and unheard of for women in France at that time. Their own husbands were dead against it, seeing their wives going for weekly lunches in restaurants, while they stayed at home … In 1924, women in France had no political rights and no personal freedom and those who pushed for women’s rights were called “suffragettes“. 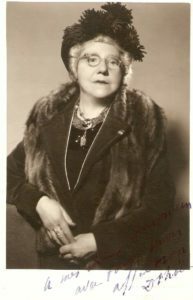 In 1930, Suzanne Noël became the first President of the Soroptimist Federation of Europe. She overcame many obstacles such as the diversity of the legal status of women in different countries and language barriers… Tirelessly, Suzanne Noël inaugurated other clubs too: Tallin in Estonia, Oslo in Norway, Budapest in Hungary and in 1935 in the Far East for professional conferences, she laid the foundations for Chinese and Japanese Soroptimist clubs. Until the start of World War II, not a year went by without a Soroptimist club being created thanks to her. She devoted endless energy to Soroptimism. She had the genius to arouse a sense of vocation in others and an infallible talent to recognize which woman would be capable of leading a new club. Whenever she explained the noble and high goals of the Soroptimist movement, any woman listening would want to join. After the Second World War, she resumed her Soroptimist work. In 1948, the clubs of Prague and Stockholm were inaugurated as well as that of Istanbul, the first Soroptimist club in a Muslim country. The following year, the Athens club was founded. 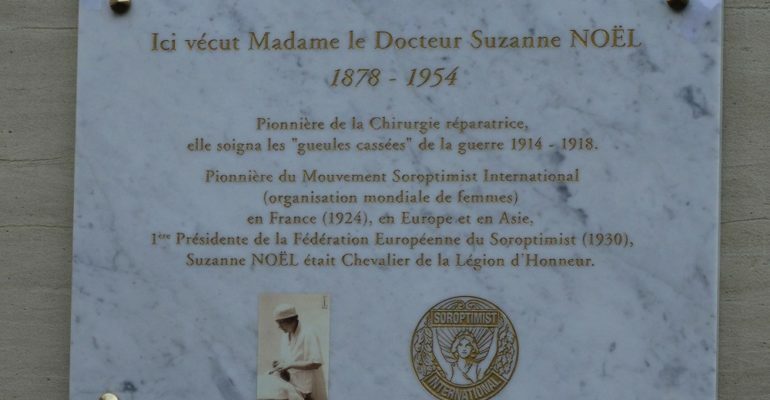 Suzanne Noël passed away on November 11, 1954 at the age of 76, and was buried in the Montmartre cemetery after a life dedicated to reconstructive surgery and the development of the Soroptimist Movement. But even today, charters of new clubs, which continue to be founded all over Europe, are given in the name of Dr. Suzanne Noël. Also, a Soroptimist fellowship bearing her name has also been instituted and has been awarded periodically to help female doctors in Europe specialize in plastic surgery.